Office Culture, Popular, Productive Office, Tips By Krista Krumina on April 10, 2017 . Where you work is as important as what you do. Various studies have found a connection between office environment and employee productivity. In fact, it’s been said that a well-designed office can increase your team’s overall productivity about 20%. A study found a company’s most productive employees can increase its yearly profit by $5,000. Meanwhile, the average cost US businesses pay for unfocused and disengaged employees can reach $450-550 billion yearly. 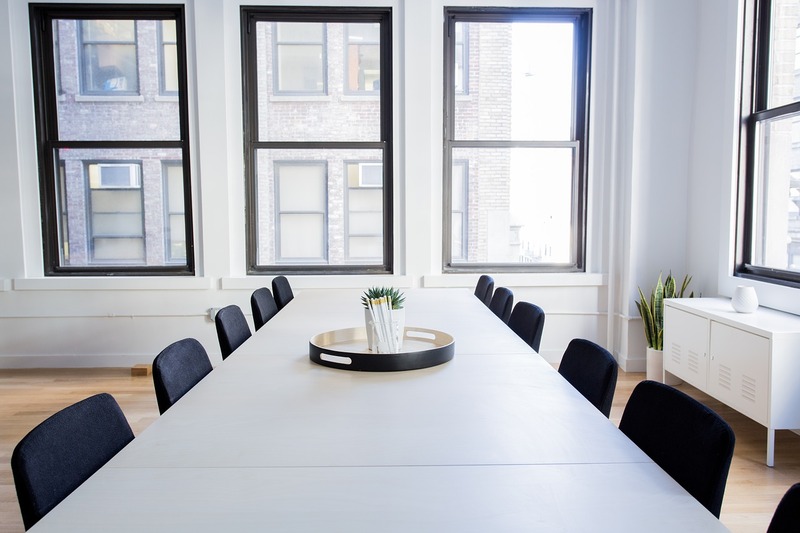 It means investing in a work-friendly office environment can help not only your business earn more, but also save money you have already earned. A modern office environment may also help you keep your existing employees engaged and motivated, as well as attract new talents. 67% of employers said they redesigned their office spaces in 2016 to make them more attractive to new workers. 67% of employers have redesigned their offices to make them more attractive. Below, you’ll find 26 office improvement tips, literally from A to Z, to boost your team’s productivity and increase employee job satisfaction. Bad air quality is not only bad for productivity, but also has a negative effect on health. It’s called the ”sick building syndrome”, known from the 1970s, when poor office ventilation caused symptoms like headaches, fatigue, coughing, and more. Studies have also found that elevated levels of CO2 between 1,000ppm and 2,500ppm decrease information utilisation, decrease performance by 10%, and increase rates of absenteeism. So keep an eye on air quality in your office, install a qualitative ventilation system, and open windows to let in the fresh air. A DeskTime study found that most productive people work for 52 minutes, then take a break for 17 minutes. People can’t focus and work 8 hours without breaks. So, having a place where employees can go for a rest, chat with colleagues, and have drinks and snacks is a must in a modern workplace. When designing your office break room, try to incorporate design elements that will help your employees relax. After all, that’s what break rooms are meant for – for employees to take a mental pause, which will help them feel rested and stay focused and effective. Bright colors, cozy sofas, snacks on the table will make your break room look comfortable and welcoming. Make it a place your team would love to go and disconnect their minds. 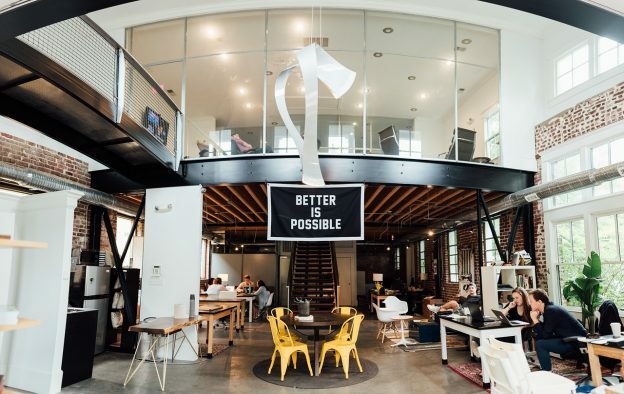 When it comes to office environment, company culture is what brings it all together and helps ensure a positive and productive office atmosphere. Many world-famous startups are famous for their company cultures that make people want to work for them and the existing employees to stick with them. What’s strong company culture that ensures a productive workplace environment? 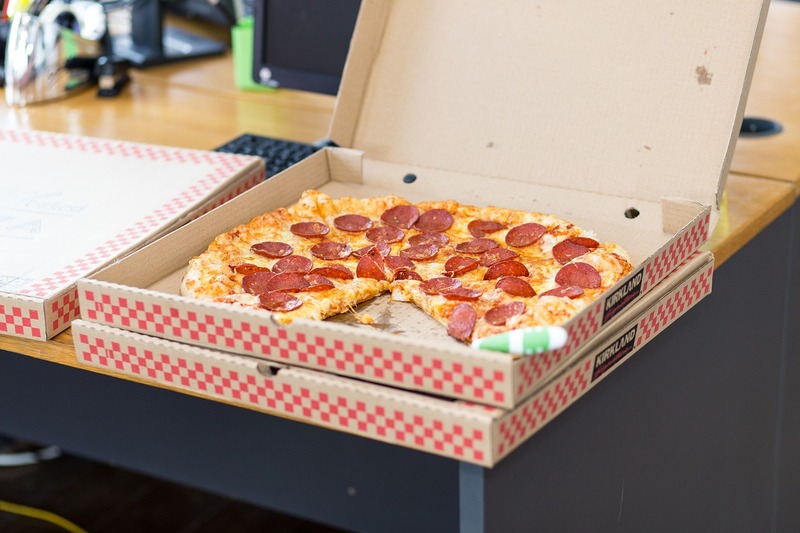 Office pizza party is a classic company culture example. Workplace transparency is crucial for employee motivation, commitment, and productivity. Knowing what other team members do, how do they do it, and where the company is going is what boosts team spirit. Here, at the Draugiem Group office where DeskTime is located, we’ve implemented digital screens in workrooms that show team’s performance. So everyone can see how other departments are doing. What data you show on your screens is up to you. If you’re using the employee productivity tracking app DeskTime, show your company’s overall performance stats or highlight most productive employees and support healthy competition between team members. Employees who have fun at work are found to be more productive. Being entertained also creates a stronger commitment, helps employees relax and clear their minds, and boosts office productivity. Companies, like Google, Facebook, Yahoo, are famous for their entertainment zones for employees. From chillout zones with slides to video games and rooms filled with plastic balls. tells Steve Benson, founder and CEO of Badger Maps. 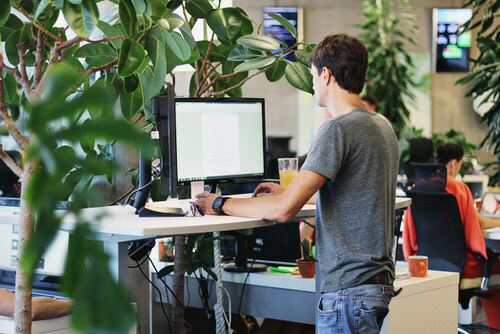 Standing desks can improve workers’ productivity by up to 10%. Sitting is the new smoking. And the reason for employee absenteeism. Neck strain, back pain, leg pain are the most common injuries employees nowadays are dealing with. To make sure your employees don’t suffer these pains, start with ergonomic chairs and individually arranged workplaces, adjusted to the proportions of the individual’s body. Or consider standing desks – we tested them ourselves and found that standing led to up to 10% more productivity! Bonus tip: Get rid of boring and outdated furniture. Turns out, boring furniture makes people lazy and may lead to employees losing interest in work. Meanwhile, colorful and vibrant furniture brings enthusiasm, alleviates stress, and increases productivity. Various companies offer their employees physical fitness programs and on-site gyms. And here’s why: physical activity is crucial for employee health and productivity. Studies show physical activities improve concentration, enhance creativity, and have other positive side effects. While you don’t necessarily have to have an in-house gym, you should still encourage your employees to move more. One way to do it is having a room or someplace in the office where people can stretch and do some physical activities. Another option is make a deal with your local gym and pay for your employees’ membership, so they can work out for free. 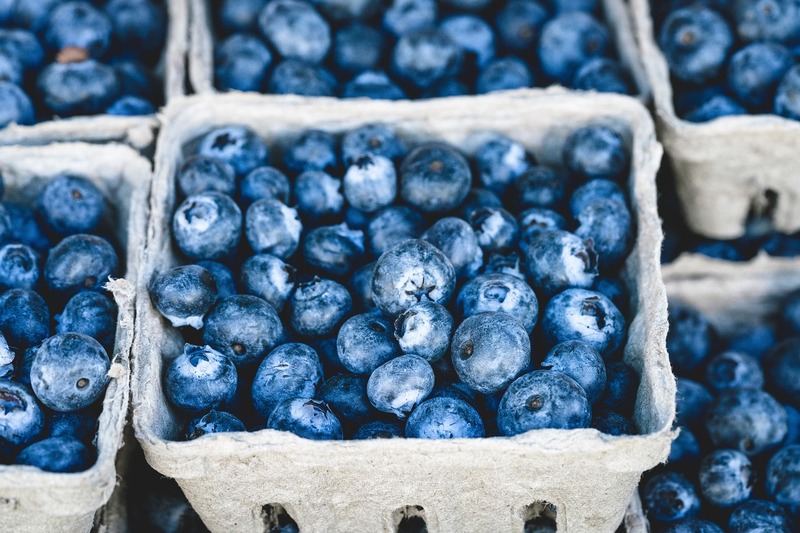 Blueberries are great for your memory. People just love free snacks. A survey found that companies that provide free food have happier employees, compared with those who don’t. By providing healthy snacks at the workplace, you’re helping your team stay healthy. It was even calculated that for every dollar a company spends on employee health programs, it saves $3.27 in medical costs. Besides, healthy snacking helps workers stay productive. According to Harvard Business Review, what people eat can largely affect their performance. Experts suggest that reading for pleasure just 30 minutes a day is enough to become more effective at work, improve focus, and deal with problems like depression and anxiety. Another study even found that reading is a more effective stress reducer than listening to music and taking a walk. So an in-house library might be a good idea if your employees are working in stressful conditions. Books you include in your company library are up to you. The only rule is: your employees must read them for pleasure. So, no mandatory literature. P.S. 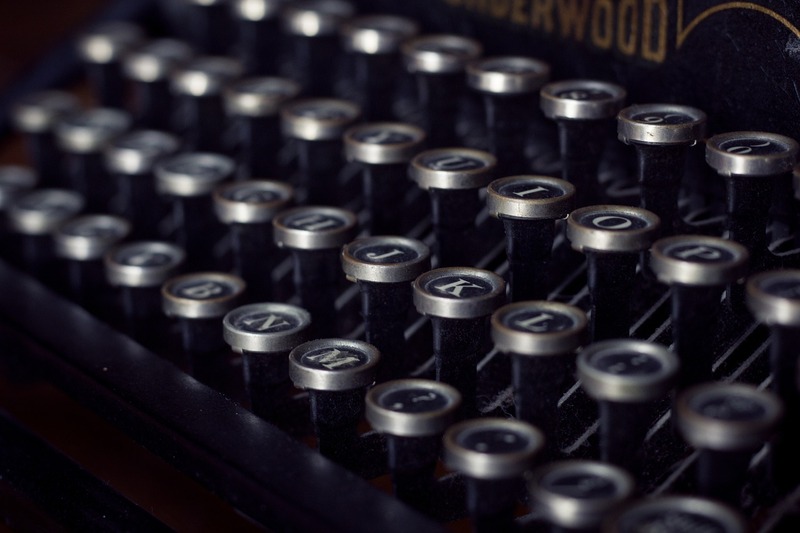 Check out this list for inspiration for your office library. 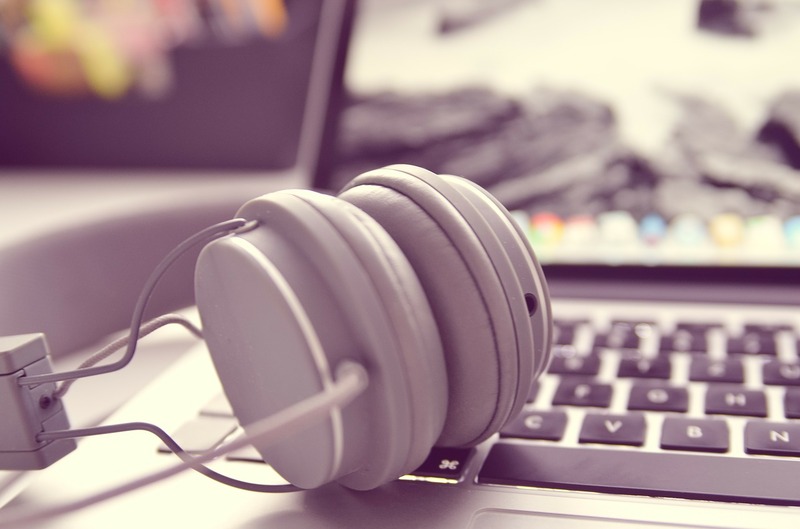 Jazzy office music is one of the best choices for employees’ productivity. 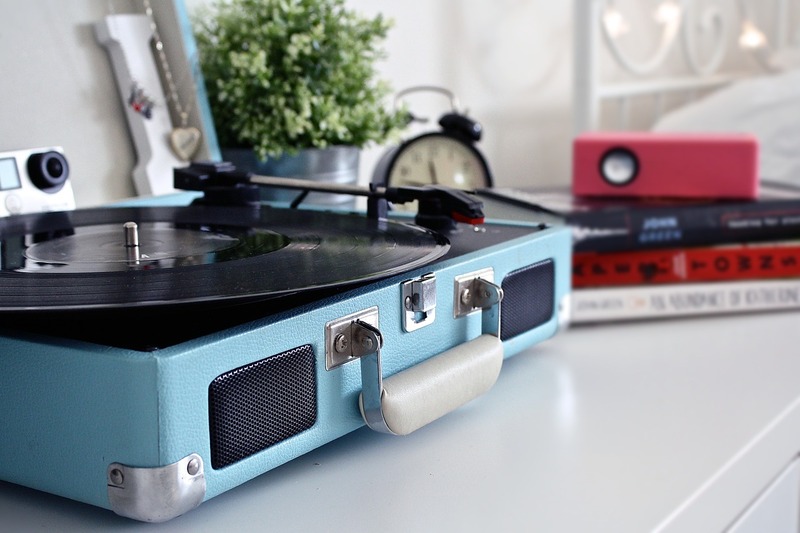 Shopify found that rhythmic and jazzy music helps workers feel more more energetic and enthusiastic while doing everyday tasks. If music in the entire office building sounds too much, you can limit it to specific rooms only. Like break rooms, office kitchen, or creative meeting rooms. tells Gene Caballero, Co-Founder of GreenPal. It can be a small kitchenette or a lunch room, but the point is – give your employees a place to have dinner or at least make a cup of tea during their workday. Proper dinner keeps employees healthy and balanced. However, one survey found that over 50% of employees eat lunch at their desks, stealing themselves time to relax and recharge. By having a kitchenette or a designated place your team can have lunch, you’re encouraging even your laziest employees to get up from their desks, move around, and get back to work more energized. Lighting is one of the primary factors that affects employees’ productivity. If your office space is too dark, workers may get sleepy. If the light is too bright, it can cause headaches and eyestrain. Studies show that natural lighting is best for employee productivity; it also enhances worker’s sleep and quality of life outside the workplace. So, for your employees’ wellbeing, try to incorporate as much natural light as possible. However, if natural light isn’t an option, consider using light fixtures that mimic natural sunlight. That way your employees will feel better, be healthier and better focused on tasks. Studies show that 67% of all meetings are useless. Employees waste hours every week in unproductive meetings. In fact, 67% of all meetings are failures, which cost businesses over $37 billion dollars every year. That’s crazy! To make meetings more productive, you’ve got to make meeting rooms less comfortable. That means – no sofas and other things that might make people feel too cozy. To encourage less and shorter meetings, consider meeting rooms with no chairs, so-called huddle rooms. You’ll notice that such stand up meetings are incredibly efficient and much more productive than the long ones. Data show that people waste 86 minutes every day because of sound distractions, and interruptions happen about every 11 minutes. 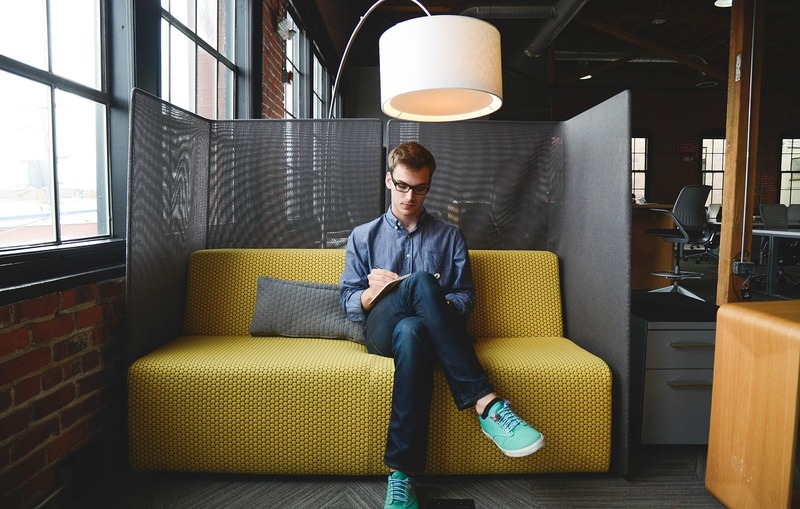 Another survey by APQC found that 71% of employees think they would be more productive with additional space for individual work and quiet reflection. So, if you can’t give your employees personal workrooms, at least give them noise cancelling headphones. They help employees zoom out and escape the noise and is a signal for co-workers to back off. Give your team soundproof headphones so they can escape noise in the office. There’s no one office plan that’s best for employee productivity. It depends on your company and business specifics. But one trend is clear: More and more companies are moving from cubicles to open office plans. Executives tend to prefer open office plans that are assumed to improve communication, boost creativity, and make a more positive, less tense office atmosphere. However, some studies show the opposite – people working in open offices often must deal with distractions; they’re unable to focus and work effectively. Meanwhile, a recent study suggests that companies should incorporate design and workspace planning cues from institutions of higher education. That way, they have better chances to attract young professionals, since college-like office design would foster coaching, support training, and leverage technology. Plants bring freshness to the office and make it look more welcoming. That’s important for attracting new employees and retaining existing ones. But most importantly, plants are found to increase workers’ productivity by 15% and ensure better air quality. Studies found that greens in general, but especially spider plants and philodendrons, are the top plants for removing pollutants from indoor air and decreasing carbon dioxide, which can be harmful to health. While some can work in office noise and deal with interruptions, others may need complete silence to work effectively. In fact, it was found that nearly 90% of workers around the world are unsatisfied with their work environments, primarily due to a lack of privacy. And while most executives prefer open-concept office, as found in a study, 36% of employees prefer more isolated workrooms. So, if your company has an open office plan, consider having quiet workrooms, where employees can go when they want to escape all distractions and work in peace and quiet. 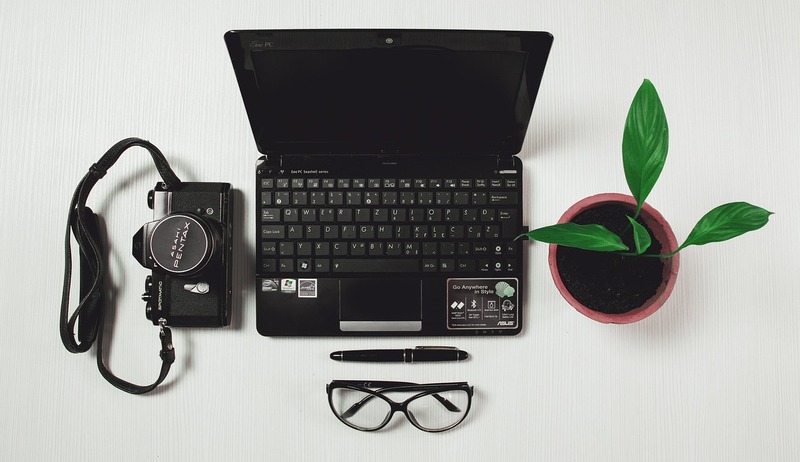 Green is found to be the best color for office productivity – it’s considered calming, which helps employees stay balanced and improve focusing skills. Blue is great for improving efficiency and, just like green, helps people focus. Choose yellow when decorating office for artists, designers, and creative workers – it stimulates creativity. Or go with red for a job that requires physical activity, since it’s intense and can increase heart rate. 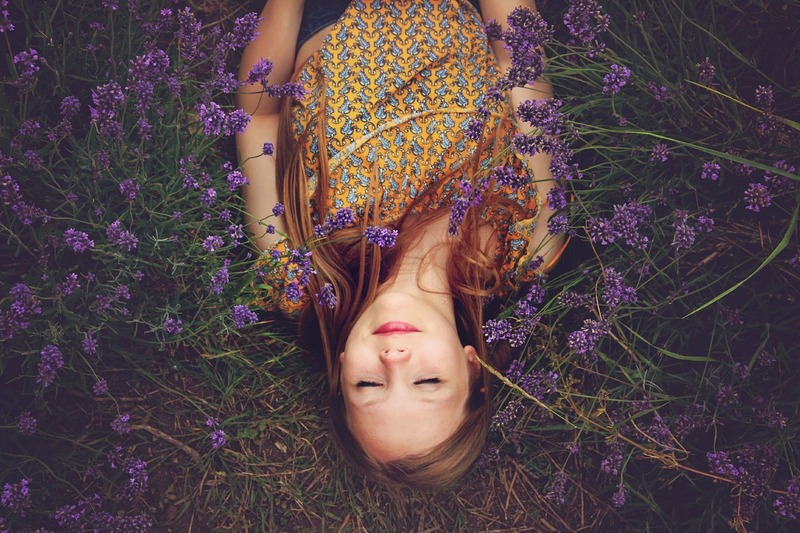 Lavender is found to reduce stress and anxiety. Aromatherapy is widely used for improving workers’ productivity. So, bringing scents into the office can help your team work more effectively. Cinnamon helps fight fatigue, and pine is for boosting energy. Citrus scents (lemon, orange, clementine, grapefruit) help reduce stress and fight mental exhaustion, improving focus. Rosemary encourages clear thinking and improves memory – use it in office rooms where employees are learning something. And lavender reduces stress and anxiety, so it will be perfect for break rooms and mediation rooms. An office that’s too hot or too cold makes it hard to focus, which is just another distraction that’s not helping your team work effectively. You will never find a temperature that’s good for everyone. But try to find the temperature that most of the team finds comfortable: remember that office temperature in general has greater influence on women than men. Overall, 22°C is the optimal temperature for maximum productivity, as concluded in a study by Helsinki University. Just one degree over and productivity starts to decrease. Motivational office posters by Startup Vitamins. Psychologists have found that art in the workplace can boost productivity, lower stress, and even encourage employees to innovate. But art is a broad concept. Therefore, the best art for productivity depends on your aesthetics. While some may prefer paintings or fine art installations, others can find one motivational poster is all they need to work more effectively. 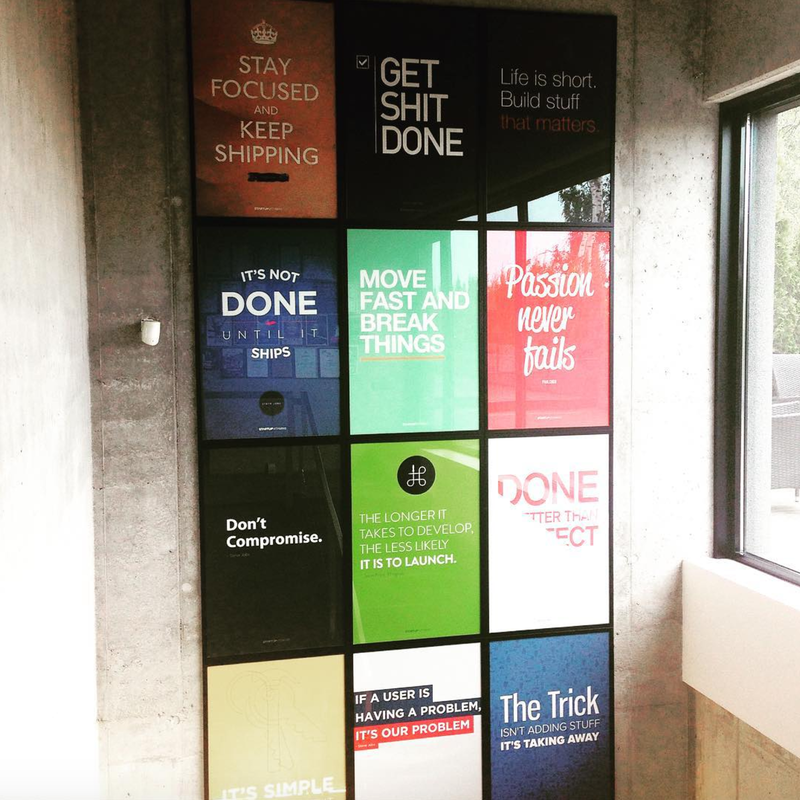 Here, at DeskTime, we’ve got a wall of inspiration – posters with motivational quotes, designed by Startup Vitamins. Employees are up to 16% more productive when they have an outdoor view. And while any outdoor view is better than no view, employees prefer landscaped areas and other natural scenes like hills, ponds, and waterways. So, if your office has got windows, seating your team so they can see outside the windows can be a quick fix to happier and more productive employees. People remember just about 5% of what you say, while they remember around 34% of what you’ve written down. 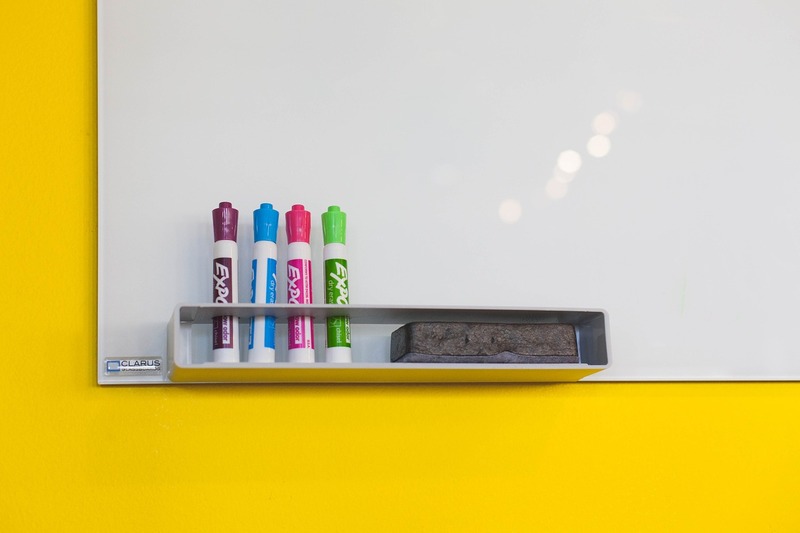 ”Whiteboards make it easy for teams to communicate visually, which helps everyone speak the same language, regardless of function or department. It’s often difficult to justify investment in new technology. That might be the reason a surprisingly large number of companies still save money on tech. However, studies show that making your employees work with outdated tech backfires big time. It was found that the average office worker wastes at least 21 days each year due to poor technology. 21 days a year. That’s more time than most people spend on holiday each year! Besides, 1/5 of employees surveyed said outdated tech is one reason they’re considering looking for a new job. So, saving on tech not only can result in lost money, but also in lost employees. Employees are losing up to 21 days a year working with outdated tech. Whatever the office plan, it’s important to give employees the autonomy to use and decorate their workspace however best suits their task. Let people put just one picture or plant on their desks, and you should see their productivity increase by 15%. Studies found that employees who can personalize their workspace however they want are up to 25% more productive than those who can’t. When people can personalize their workspace, it makes them happier and satisfied. And happy employees do a better job. Simple as that. Meditation has various health and psychological benefits, and there are tons of studies that prove that. Some of the benefits include reduced stress, better focusing skills, and greater ability to prioritize effectively. If you create a meditation room in your office, make sure its design is calming and relaxing. 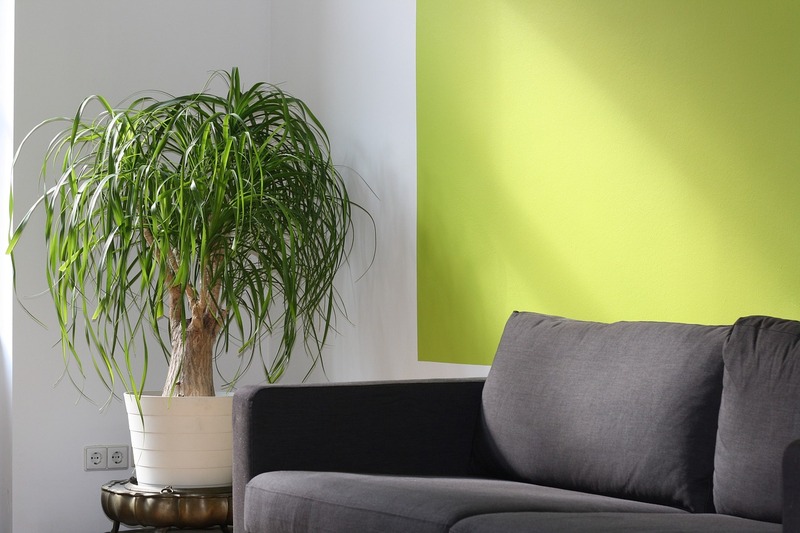 That is, use relaxing colors, like green, bring in plants, make sure this room has got plenty of fresh air. On the other hand, you can use any office room for meditation. 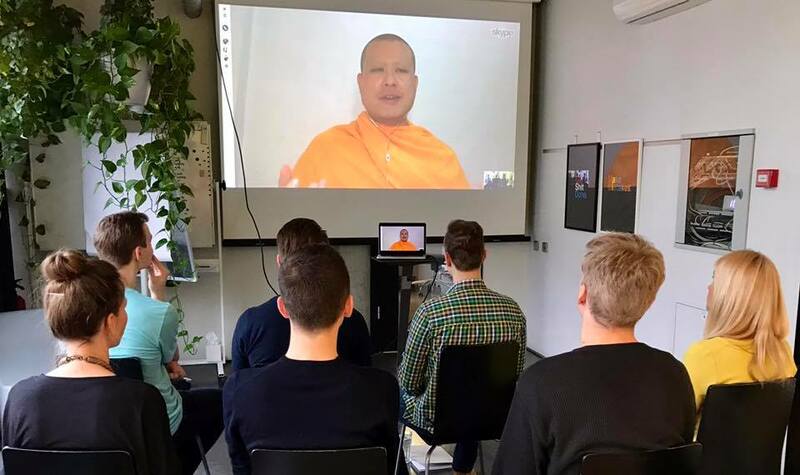 Here, at DeskTime, we meditate in meeting rooms or the kitchen, and our meditation sessions are run by a Tibetan monk… via Skype. Meditation session at the DeskTime office with a Tibetan monk. Which of these ideas did you like the best? Let us know in the comments! Thanks, Chantille. It really is. I think the air quality in our office may not be the best. Many of my co-workers cough at work but not at home. Great read, always looking for extra ways to be more efficient around the office. I just wanted to share something I’ve been doing recently. I run an office and have noticed that unused toner was piling up in storage. Looked into returning but that was no good. Tried out the site http://www.tonerconnect.net/ and was impressed. They had quick service and that payout was nice. Zen meditation room would be awesome! What a great read. Thank you for sharing this amazing article!